I've ordered some styrofoam mannequin heads and these should arrive in the next four weeks. Will make for better props. 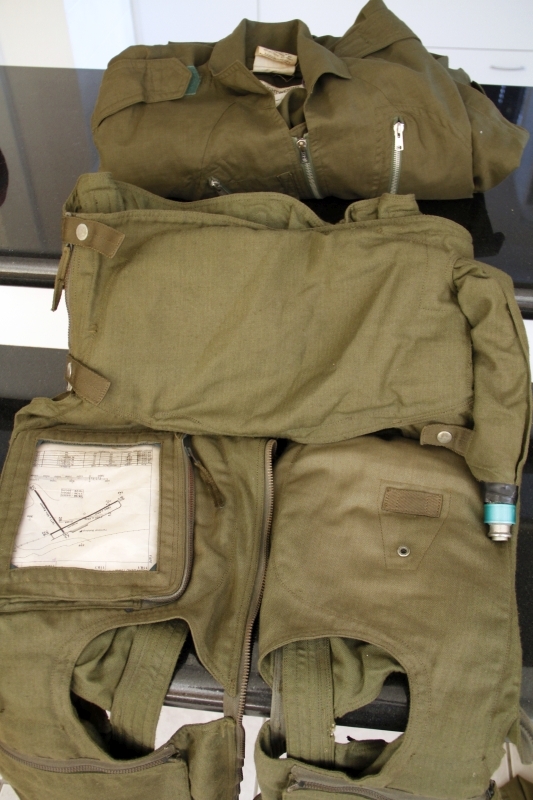 Clansman Anti-G garment Mk2A as used by Mirage F1 pilots. Nice, I have one of those too (1986 mfr). The pilot must have been a jockey as there's no way I can fit into it! Mines at the other end of the spectrum ... long! It complements my Aerazur Type 817-M2 anti-g suit which arrived with the Mirage IIIs. Mine's also a Mk2 A SPEC: KA3259 (Made 1986) Size: Small Regular. Are these South African or foreign produced? Also trying to figure the most effective way to display it? Over a mannequin wearing a flightsuit would be the most obvious answer but the ones I've available here are not jockey dimensions either. I'm interested to see how it compares, visually. Yup, I was also thinking of purchasing a mannequin or two (one for jet pilot, another for helicopter). Major visual difference is that the Type 817-M2 has only one 'transparent' pocket and a clip for the air hose. Cool. Do you know if the Clansman is manufactured in South Africa or "from the overseas"? Clansman was based in Pietermaritzburg, also manufacturing flight overalls, flack jackets, etc. I think the Clansman Mk2A was the general anti-g trouser for the SAAF during the 70's and 80's and 90's. Thanks Dean, yes the SAAF flightsuit I have is also a Clansman. I've not added to this thread for a while, but the collection has grown substantially. Arrived this week: USAAF K-2B lightweight flying suite, used by a SAAF 2 Squadron Sabre pilot in Korea.